The objective of Adem Önalan’s master’s thesis, Vakit: On the Elasticity and Subjectivity of Time, is to reframe our relationship with time—identifying opportunities that lead people to spend time well—from recontextualizing time, to slowing it down through meaningful, memorable life experiences. We no longer get to make the decisions about where we spend our time; instead, the world dictates what we pay attention to. Adem believes our relationship with time has become problematic. The average person spends about five hours a day on their smart phones, where we lose our sense of time when scrolling through bottomless feeds in a constant state of distraction. We no longer get to make the decisions about where we spend our time; instead, the world dictates what we pay attention to. These distractions—caused by consumerism, the media, and technology—take time away from family and community bonds, social responsibilities, our passions, and our hobbies. Adem’s research looked at time through the lenses of physics, neuroscience, chrono-biology, and psychology. He read widely—ranging from hard science to fiction, and conducted interviews with over 30 subject matter experts. 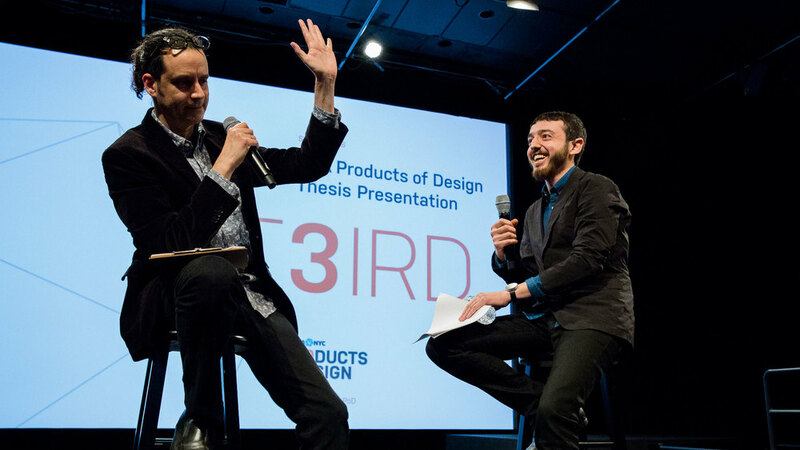 In order to observe how people experience time, he organized a workshop where he conducted his “one-second experiment”—testing whether or not people would perceive the duration of one second differently, and how time could warp in different situations. Here’s how the process worked: On the product shown below, participants were asked to push the button "once per second." The device then calculated how long each person perceived one second to be. (Here, subjects overestimated the amount of time one second was, with an average of 1.82 seconds.) Next, the participants were asked to run around the room for three minutes, after which the experiment was repeated. Each person’s perception of time changed drastically. (Here, participants were much closer to an accurate second, with an average estimate of 0.96 seconds.) This process revealed how our perception of time is subjective, and perhaps more importantly—that it can be altered. The Timeoff clock is more than a gimmick; it is a way to say “no” to the distractions that constantly fight for our attention. Building up on this work, Adem wanted to experiment with display of time not on our walls, but on our wrists. 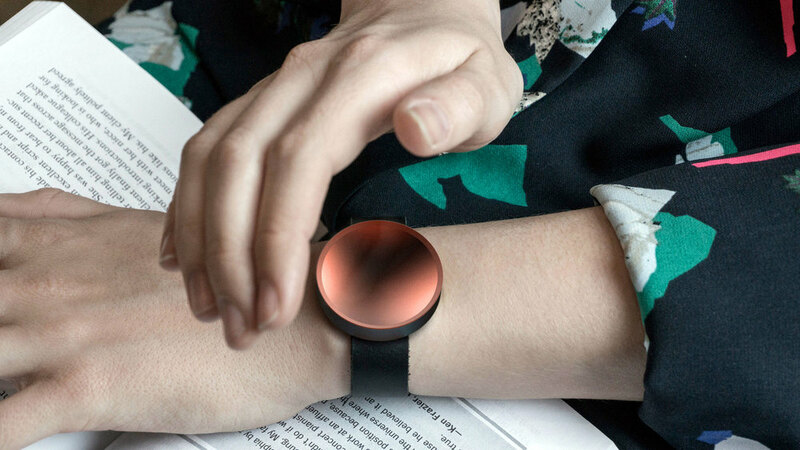 Reflect is a smartwatch app that changes the relationship between users and their clocks. In the original relationship, the user asks the clock what time it is; in the new relationship, the clock asks the user what time it is. Time is also valued when it is spent with loved ones. Sync is a platform that functions as a timekeeper—increasing the quantity and quality of time spent together by two people. Sync geo-locates two people in a couple and visualizes their movements through a unique, interactive clock face. Each person has a specific color for his or her individual clock display, and couples can anticipate when they will be next be together. When they get closer to each other, their individual clocks also get closer to each other. 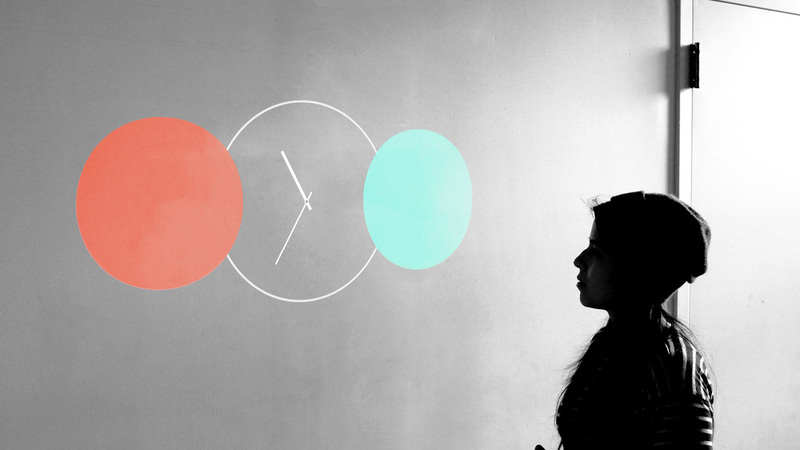 The two clocks only become a "single clock" when the individuals fully sync with each other by spending time together. Additionally, through an online dashboard, Sync can also show how much time they spend together each day, week, month, and year. Neuroscientist David Eagleman advises, “Make sure you stretch your mental landscape by putting yourself in situations where you are learning something new. If you want to slow time down, seek novelty.” The reason that children experience the passage of time more slowly than adults is because everything is novel to them. The human brain doesn’t process new memories as we age, because things are no longer new to us. We are not able to differentiate last April from last March, for example; often we don’t even remember what happened just three days ago! Adem envisioned Novo—journal app that encourages and challenges you to bring novelty into your daily life. At the end of each day, it asks you if your day was novel or not. You reflect on your experience in the app, and a beautiful pattern is algorithmically created based on your feedback. "Your memory attaches this striking pattern to your experience, so when you see it, you recall your extraordinary day,” says Adem. "Novo creates a calendar of extraordinary experiences: You can see where/when you had a novel experience, and where/when you didn't. Here’s how it works: When a “remarkable” moment happens during your day—perhaps a great lunch with an old friend, or something amazing you saw in the street—you simple lay your hand over the “watch face” to mark it. That’s it; no other gesture is required. When triggered, Etki doesn’t capture any audio, video, or images; rather, it only records the time and location of the event that occurred. At the end of the day, you can use Etki to remind of of the time and place of your “marked” moments, but you’ll need to use your memory and imagination to recreate them in your mind. Etki’s purpose is beyond documentation—it is about recalling memories. The device forces you to think about the quality of the time spent in your daily life, “and reminds us that often very remarkable things happen to us...it’s just that we may not notice them,” Adem adds. "As a consequence, Etki motivates you to try to spend your next day more thoughtfully." Etki can also be paired with an app that aggregates user data, allowing you to compare your days. Importantly, Etki leverages the special relationship we have with our wrists—especially when we express our emotions. The image below of a child striking a power pose shows how intuitive the behavior of capturing memories can become. Ultimately, the hope is that the gesture of capturing your moments through Etki will be conditioned; that you’ll instinctively reach across to cup the watch whenever something noticeable, remarkable, or memorable happens. And when the gesture becomes conditioned, the behavior can dissolve organically into the flow of the moment, instead of distracting from it. Through all of his thesis work, Adem aims to bring forward an ancient perspective of looking at time—vakit—to the way we value and experience time today. Learn more about Adem Önalan’s work at ademonalan.com, and contact him at ademonalan@hotmail.com.